Sylvia said her favorite design on my site was an antique window (above) which was a transom in the First United Methodist Church in Greensboro, Alabama, built in 1907. She liked the window as-is, except of course, built in her colors. 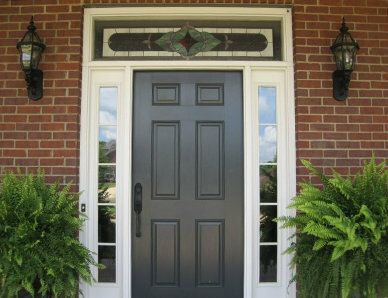 Sylvia contacted me about building a transom for her newly built home in Amory, Mississippi. With her Mississippi accent and my South Alabama accent, right away I knew we were speaking the same language and would get along famously. Sylvia knew exactly what she wanted. 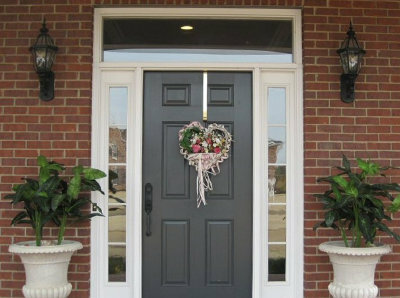 Her entryway had a clear transom installed when the house was built, but Sylvia wanted a little color in her front foyer. Sylvia wanted to let in as much light as possible, so we used a clear seedy glass as both the center and outside backgrounds. She chose pastel colors to match the decor in her living room with a bold red band and a number of jewels for accents. 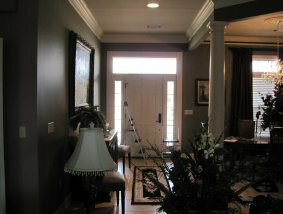 Sylvia and her husband were gracious enough to send me the pictures below showing before and after installation. 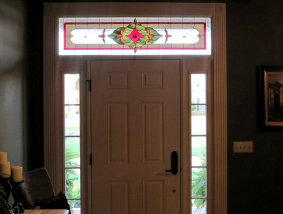 Sylvia's Transom measures about 62 1/2" x 15 1/2", contains 136 pieces of glass and was completed in June of 2010.